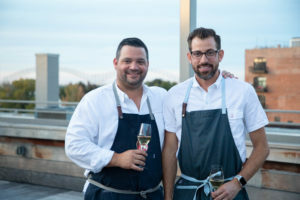 Born and bred Memphians, Andy Ticer and Michael Hudman opened Andrew Michael Italian Kitchen in 2008 to feature innovative Italian cooking rooted in Southern tradition. The Chefs trained at Johnson and Wales University in Charleston, South Carolina and the Italian Culinary Institute in Calabria, Italy. Their second restaurant, Hog & Hominy, is a wood burning, neighborhood eatery and was named one of the top new restaurants by GQ Magazine, Southern Living, and Bon Appetit as well as a semi-finalist for Best New Restaurant from the James Beard Foundation, which also named the chefs semi-finalists for the Best Chef: Southeast award for three consecutive years during 2012-2014, and a finalist for the award in 2015, 2016, and 2017. In 2013, they were awarded Food & Wine Magazine’s Best New Chefs Award and named in Starchefs.com’s 2014 Kentucky-Tennessee Rising Star Chefs. In his review of the restaurants in 2013, Pete Wells of the New York Times called the restaurants “A sibling rivalry worth diving into.” Early 2015 saw the opening of the chefs’ third space, a craft butcher shop and café, complete with classic pastries, coffee, espresso. Porcellino’s Craft Butcher received four stars from The Commercial Appeal and made the Bon Appetit list of Top 50 new restaurants for 2015. The chefs opened Josephine Estelle in the Ace Hotel New Orleans in March 2016. The restaurant made Bon Appettit’s top 50 Best New Restaurants and Southern Livings Best New Restaurants in the South. Catherine & Mary’s, the chef’s first restaurant in Downtown Memphis, opened in September of 2016 and brought together their blend of grandmother cooking, Italian philosophy of dining, and southern ingredients to the heart of the city. In January of 2018, the chefs opened their second downtown restaurant, located in the Old Dominic Distillery on South Front Street. This most recent addition embraces a new and exciting restaurant concept, featuring an open kitchen, wood fire cooking and a raw bar, all overlooking the Mississippi River in the South Main Arts District of Downtown Memphis.